May 8 (UPI) — The Cincinnati Reds sent catcher Devin Mesoraco and cash to the New York Mets on Tuesday in exchange for pitcher Matt Harvey. Harvey will join the Reds later this week in Los Angeles. The Reds also selected the contract of catcher Tony Cruz from the Triple-A Louisville Bats in a corresponding transaction. New York also placed Todd Frazier on the 10-day disabled list, due to a left hamstring strain. The Mets transferred Anthony Swarzak to the 60-day disabled list in order to make room on the 40-man roster. Mesoraco, 29, is hitting .220 this season with a home run and three RBIs. The 2014 National League All-Star is a career .234 hitter in his eighth season with the Reds. Mesoraco was the No. 15 overall selection in the 2007 MLB June Amateur Draft. Harvey, 29, had a 7.00 ERA and 0-2 record in eight appearances this season for the Mets. The 2013 All-Star went 5-7 with a 6.70 ERA in 19 appearances last season. Harvey is due $5.62 million this season and is a free agent in 2019. Mesoraco is also a free agent in 2019. He has a $13.1 million salary in 2018. 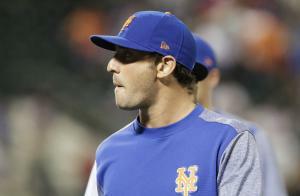 The Mets designated Harvey for assignment on May 4 after he refused a request from the Mets to go to the minors. Harvey was previously demoted to the bullpen in 2018 after he struggled as a starter.